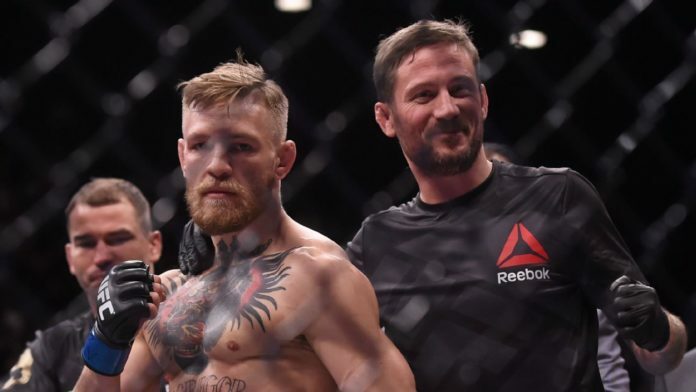 Conor McGregor’s coach John Kavanagh admits that he isn’t thrilled with some of his fighter’s antics. McGregor is widely regarded as the biggest star in the Ultimate Fighting Championship (UFC), but some believe the shine is fading. The notion doesn’t so much boil down to his submission loss to Khabib Nurmagomedov as it does his legal issues. McGregor has been arrested for attacking a fighter bus and smashing a fan’s cellphone. He’s being sued by fellow UFC fighter Michael Chiesa and is reportedly under investigation for sexual assault in Ireland. “I do [care], I absolutely do. [I care about] the perception of the sport; it’s been around before Conor and it’ll be around after he’s finished with it. I do think, myself and everyone in Ireland that’s involved in MMA, we’re hugely thankful for what Conor has done. He shone a huge light on what we did…but he has made mistakes that I absolutely don’t condone. I know he regrets them, he’s paid for them, he’s trying to learn from them and he’s trying to move on. Do you think Conor McGregor’s downfall has begun?